Fax machines can be found is almost every workplace and in plenty of homes. But you could be putting yourself at risk of identity theft by using many of these machines. Some, called thermal fax machines, actually keep a carbon copy of every document ever sent, "Early Show" Consumer Correspondent Susan Koeppen reports. All you have to do is open it up, and a wealth of information will be at your fingertips. "It's so easy to steal information from one of these machines, even a child could do it," Koeppen said. 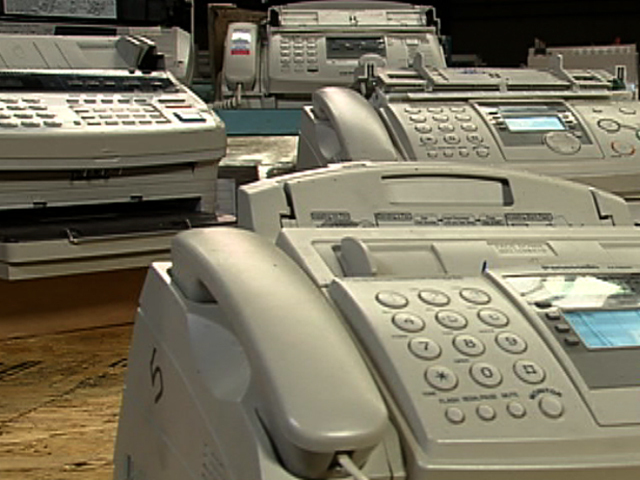 Americans will spend $55 million on new fax machines this year. The machines are an easy and cheap way to send and receive some of our most important documents, from bank statements to medical records. But the person on the other end of that fax might not be the only person that receives your information. John Miller, vice president of Metech Recycling, a certified recycler of electronic waste, spoke to Koeppen about the danger of this information getting into the wrong hands. His facilities receive thousands of fax machines each month. Some of them are thermal fax machines, which are often loaded with personal information. Miller demonstrated how it's done. He said, "You're simply going to pull the ribbon out, unroll it and put it up to light. You can read anything that went through this machine." At a recycling facility, Koeppen explained, personal information gets destroyed, but when fax machines get tossed in the trash or sold online, that personal information can easily fall into the wrong hands. To see what could be found, "The Early Show" purchased seven used fax machines from across the country, on eBay and Craigslist. Every single one had personal documents and Social Security numbers. But on one machine, Koeppen discovered a mother lode of information, including names, addresses, account numbers and Social Security numbers of people who'd sent information to the machine. "The Early Show" purchased the machine for just $10 on Craigslist from a mortgage broker in Massachusetts. The machine contained bank statements, retirement accounts, W-2's, and the names and Social Security numbers of 16 unsuspecting customers. Koeppen and her team tracked down two of those customers, Corey and Kristine Matthews who had faxed everything their broker needed to purchase their first home. Corey Matthews said he was surprised and angry to find his information had been found. He told Koeppen, "It's upsetting to think that any stranger could have obtained that information and used it in a harmful way." Kristine added, "Anyone could've opened credit cards, cleared out bank accounts. I mean, who knows what could have happened?" Finding the Matthews information was simple, Koeppen said. It came from just the kind of machine an identity thief is looking for. The Matthews were glad the fax machine was found by CBS News -- and not somebody else. The couple said they're going to shred tape with the information on it. Domestically, identity thieves are looking for these types of machines, for sale or in landfills, to do what's called data mining, Koeppen added on "The Early Show." However, she said, this is also an international problem, since much of the United States' e-waste is shipped to Third World countries, where people are looking for information and using it. Koeppen advised that, if you have one of these fax machines and you're going to sell it, make sure to shred the machine's ribbon! In addition, certified recyclers, Koeppen said, are available to dispose of the machine properly. As for faxing in the future, Koeppen said, it's important to learn what kind of fax is being used or pick another way to send your documents that's more secure.